Last week I joined Kate on Thin Ice for her Getting Your Groove Back Blog Hop. This is a way for mums to share stories about how they are reclaiming themselves after having children. My life is full of such stories, some successful, some not, but I’m working on finding a new me. This week Kate has asked us to suggest a song that inspires you to make changes and to talk about ways of making your body feel better. I took up running 5 months ago. I had run a little bit after the birth of my 2nd child but never managed more than 2 miles. However, after my third I was determined to get fit again and reclaim the body I had before the children. My husband suggested a 4 mile route, I reluctantly agreed, expecting to walk the last mile. I played gentle music and took it slowly and was amazed that I managed to run 4 miles and it didn’t seem that difficult. 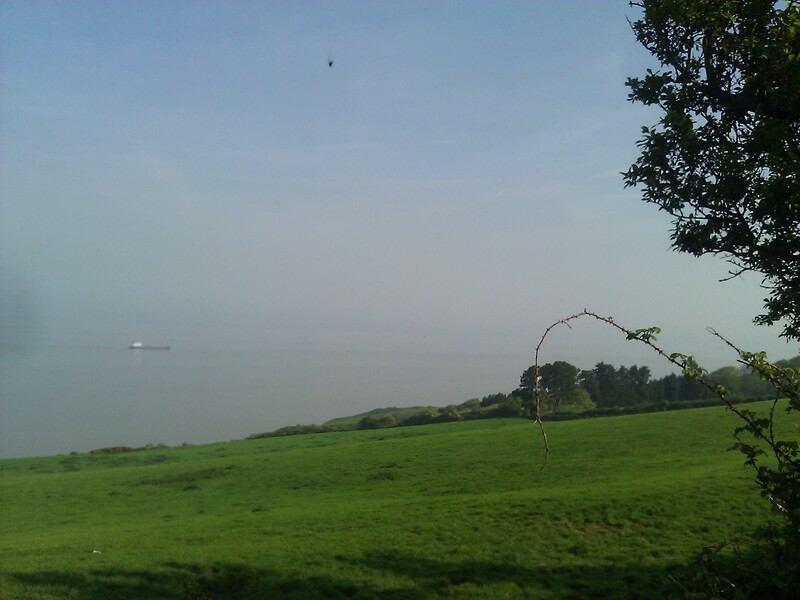 My 4 mile route involves running downhill with views of the sea and then climbing back up to home. I love being outside and seeing the beautiful scenery, with music and my thoughts for company. I sometimes pass cyclists or other runners and they always smile. I feel healthy, free and able to conquer the world when I run. My usual music is Adele 21, not only is it good for keeping a steady pace but also the lyrics help me to feel that whatever life throws at me, I am important and strong. Sometimes I feel compelled to let rip and sing along at the top of my voice, but haven’t yet been brave enough. The 4 miles soon progressed to 5 and 6 and I still wasn’t finding it particularly difficult. Couple that with the ability to get out in the sunshine with quiet time to think and the feeling that I could conquer the world and I was soon hooked. 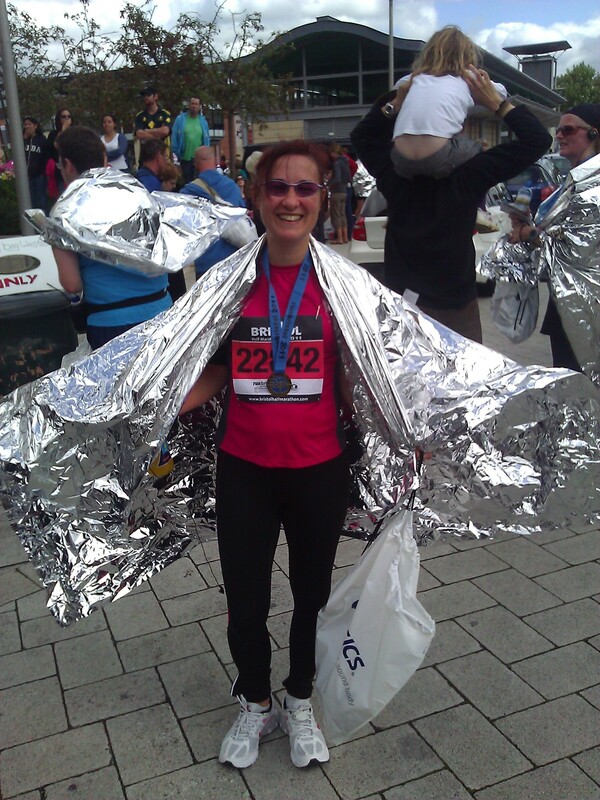 At this point I decided to enter the Bristol Half Marathon. Training continued until I was able to run 9 miles. I had no idea if I would be able to run the half marathon distance, but I wasn’t worried as I was happy to walk a few miles if necessary. I started the half marathon at a slow pace, letting lots of people overtake me, secure in the knowledge that if I kept a steady pace I wouldn’t burn out before the end. After 4 miles I felt good and was still comfortable at 6 and 7 miles. From 8 miles I kept looking out for my family, I knew they were coming but wasn’t sure where they would be. Before I reached 10 miles I had a message to say that they were near the finish, this spurred me on. The 10 mile point started to climb a hill. My usual route is very hilly so I knew that I could tackle it and picked up pace. Also by this point I knew that I would make it and that I would get to see my family cheering me on at the end. I made it to the end it wasn’t easy but I would certainly do it again. I have already booked in for my next one in the Spring. Running has given me a new lease of life. I have never seen myself as a sporty person but this is something I can do. My figure isn’t quite what it was before children but it is certainly getting there. After I have been running I feel really good about my body and in the summer I got a tan to boot. So how does going running fit in with looking after young children? Ideally I would like to start the day with a run every morning but I will have to wait until the children are older for that. I don’t run as often as I would like, but I can usually manage at least twice a week and try to use the cross trainer when I can’t get out. After reading an article in my women’s running magazine about how mums find time to run, I am seriously considering trading in one of my buggies for a running buggy. My middle daughter starts pre-school soon and I will have more time with just one child, so this could be the answer to not getting out enough. I’ve tried lots of types of fitness and never really stuck to anything. What I love about running is that it gets me outside and away from my life as a mum. It won’t suit everyone but it’s right for me. I’m just sorry it took me until I was 40 to discover it. Thanks for linking up and another very inspirational post. I bet there are loads of mums out there who would like to run but write it and themselves off. Your post will help them lots. Good to hear your musical choices too. I also like how you talk about how you are currently bottling singing out loud but am sure that will change as you groove on. See you next week I hope. Wow, go you! I did a 10k in June and haven’t been for a run since. This is just what I needed to get back to it – thanks x.
I’ve signed up for a half marathon in May next year. I was a non-runner until about 5 weeks ago. Getting into it though. It can be difficult finding the time. I might invest in a cross trainer for the house… I was determined to get my figure back for my 30th birthday in January and I’ve already achieved that target! Very pleased with myself. The title of you blog post caught my attention as I have recently tried to start running, the furthest I have managed is 2 miles but that has astonded me and I am not more determined than ever to run much further. A friend has challenge my and t’husband to doing the Edinburgh half marathin and I fully intend to sign up, after all without a goal I may never get as far as I want to. Well done on your running, you have inspired me! My dad is a runner too, his regular run was 8 miles until he turned 60 and then moved to cycling. I never saw myself as a runner but I don’t suppose I ever really tried. I’m sure it must be in the genes. Maybe one day like me you’ll find it fits, who knows?